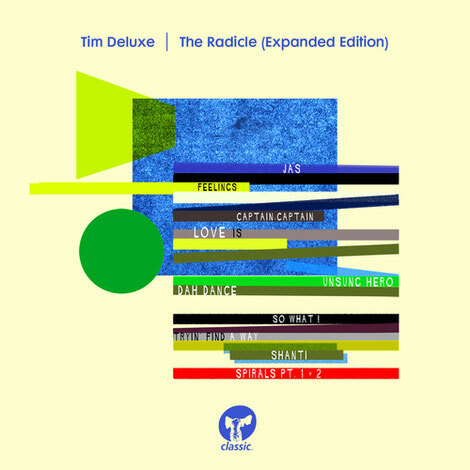 Tim Deluxe releases ‘The Radicale (Expanded Edition)’ on Classic Music Company. Doctor Barbara Ann Teer’s words on the album’s opening jam ‘JAS’ may have been lifted from an old Folkways record, but that doesn’t make the sentiment any less prescient. In fact, these words could have been said by Tim himself in reference to the spirit and ideology of ‘The Radicle’, only his third artist album to date. Born out of a pure love of real instruments and instrumentation, and with a decidedly soulful, blues-y feel, ‘The Radicle’ is arguably different from the majority of electronic albums out there. Tim took his time and immersed himself completely into the record, surrounding himself with contemporary jazz musicians, making for a sonic adventure with ideas bursting from every kick and lick. There’s a cover of the Miles Davis classic ‘So What!’ which bends the trumpet classic into new forms while ‘Shanti’ explores a more mystical Indian vibe with a sax solo John Coltrane of which would be proud. Presented as an Expanded Edition, the album is supplemented by nine club-focused remixes, including a brand new, exclusive Live Disco Revision by Terry Grant & Luke Solomon, that manages to be both dynamic and sensitive, and some syncopated Bonus Beats courtesy of Classic Music Company label-mate Eli Escobar. It’s out 26 May on Classic Music Company.